In my previous post, I discussed how our middle school-aged son was tasked to complete his science project like an actual project. Along the way to the completion of the final project, he had to accomplish a series of tasks with a series of completion dates throughout the fall term. 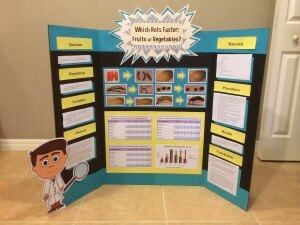 At the end of the first stage of the project, he ended up with a prototype of what the larger science project display would look like, were he one of the five students in his class chosen to continue to the school-wide science fair. Hand in your completed science project for consideration at the school science fair. Each of these tasks was given a firm due date. In some cases, only proof of experimentation was needed (a few photographs of what you had accomplished). Basically, these steps were created to make sure that students got done what they needed to in time for that final completion date later in the fall. In total, the different tasks were spread out over the period of three months. In the end, my son’s science project was one of the five science projects in his classroom selected to enter the school-wide science fair. As such, he was told to take what he had put onto his smaller prototype display (as per the previous post) and create a full-sized version of that display. That final display can be seen in the photograph above. And after the school-wide science fair, his project was selected to represent his school at the county-wide science fair! So working the science project like an actual project, with project deadlines, milestones, and deliverables, turned out to work well in his favor. Wish him and his schoolmates luck at the county-wide fair!